Сombine comfort and style, Mövenpick Resort Kuredhivaru Maldives offers discerning guests the ultimate beach holiday. 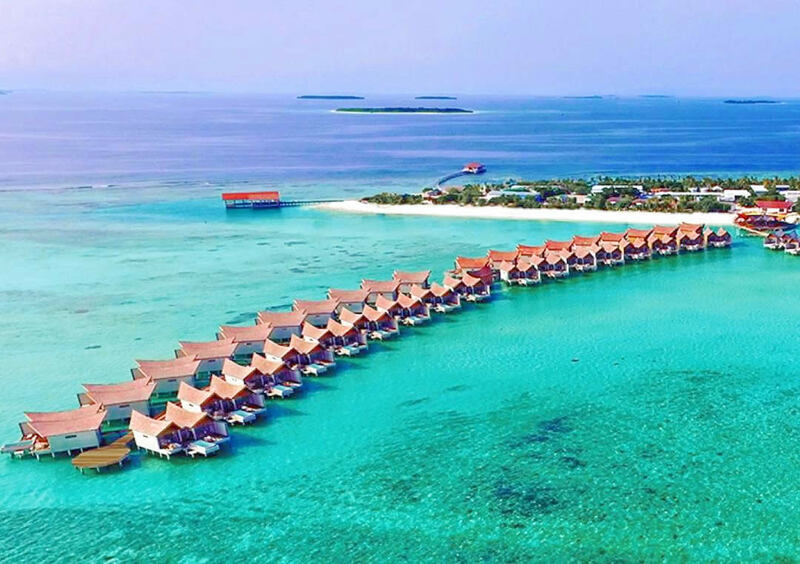 Opened in Nov 2018 and designed as a destination for relaxing and rejuvenating escapes, Movenpick Kuredhivaru promises serene seclusion and tropical tranquillity. Both thrill seekers and leisure lovers will find everything they need along the resort’s white sand beaches, where picture-postcard scenes present themselves at every moment. The resort was designed on the private, uninhabited tropical island of Kuredhivaru as a blank canvas on which to create something aesthetically appealing and truly unique. Taking inspiration from the Maldives’ spectacular natural scenery, expect to discover the stunning island environment, blurring the boundaries between innovative design, Maldivian heritage and Mother Nature. The resort is designed in a contemporary style with emphasis on comfortable accommodation and a private, yet stimulating resort experience. Every modern convenience is incorporated amidst desert-island luxury, reflecting Mövenpick's renowned commitment to genuine comforts, delivered exceptionally well. Organic shapes for the roofs in villas and restaurants make the structure blend better with the environment. 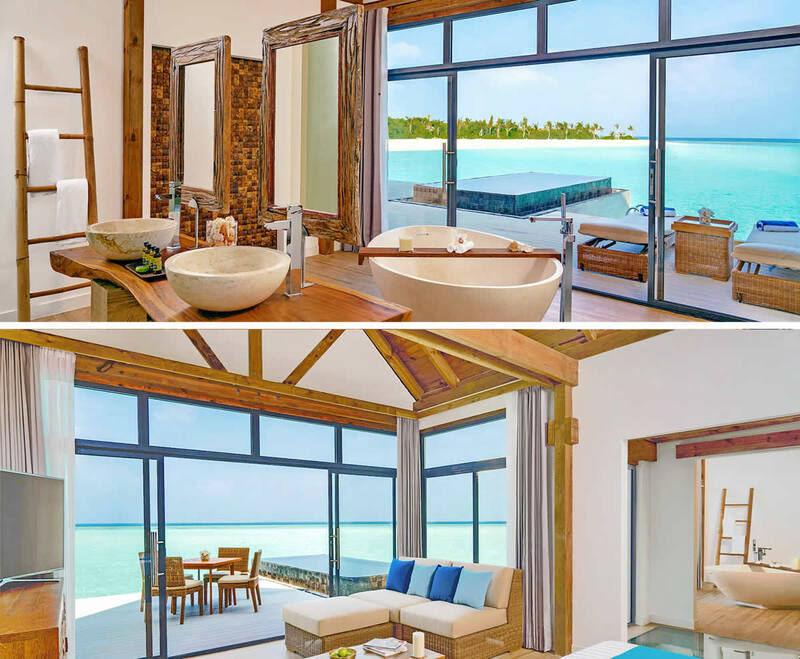 Interiors were dictated by ergonomy, to give to the guest comfort to stay close to nature, nature is the biggest luxury in the Maldives and architecture should just make it more prominent. 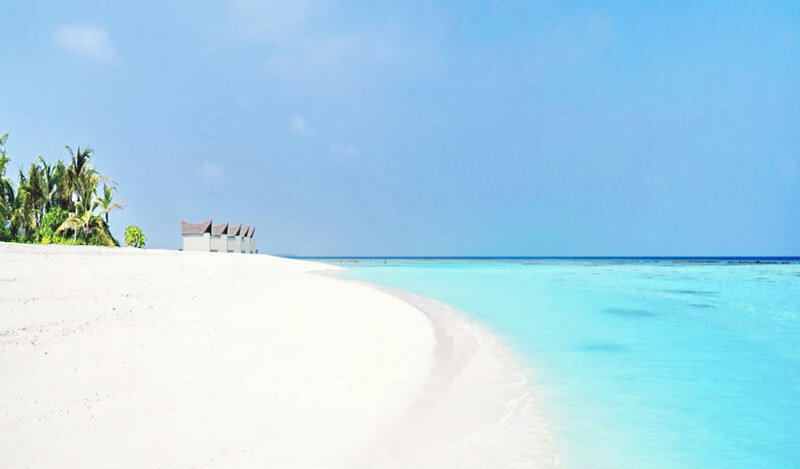 The resort is located on Noonu Atoll, in the northern part of the Maldives, which remains the least developed area of the Maldives, offering guests untouched natural beauty, abundant sea life and endless views across the Indian Ocean. The five-star Mövenpick Resort Kuredhivaru Maldives is reached by a short 45 minute flight by private seaplane timed to suit guests’ itineraries, directly from the main airport on Malé (MLE). 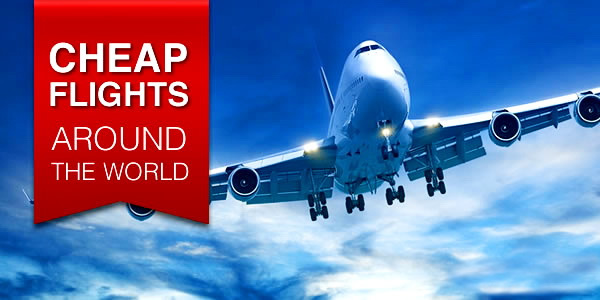 Alternatively, the resort can be reached via domestic flight and speedboat. Sandy white beaches, where picturesque postcard-worthy scenes can present themselves at any moment, ring the shores. The resort is also situated in a prime diving location, close to some of the best dive sites in the north of the Maldives. 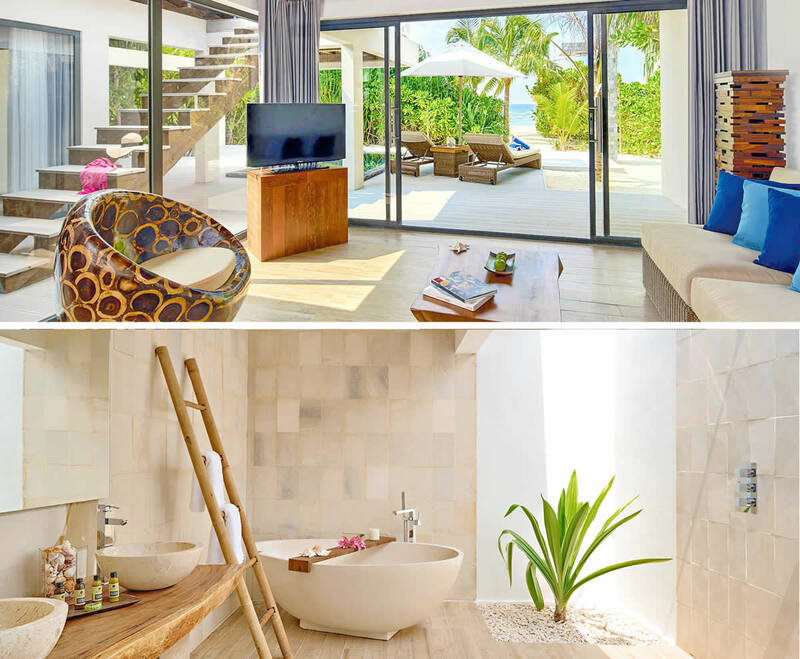 Each of the 72 Overwater Pool Villas, 30 Beach Pool Suites and 3 Beach Spa Pool Residences are private havens of comfort, comprising large living rooms that lead to wide bathrooms with stand-alone bathtubs and floor to ceiling windows from which to enjoy the shimmering tropical sunlight. Traditional Maldivian arched ceilings of each residence allow fresh air to circulate freely, cooling and adding a sense of abundant space within. The large bathrooms complete the sense of private indulgence, with walk-in rainshowers and large bathtubs next to floor-to-ceiling windows. The Beach Pool Suites and Beach Spa Pool Residences are located on the main island, each positioned at least one unit’s distance from neighbouring villas and face out to the ocean. Intimate verandahs include dipping pools and shaded gazebos, perfect for relaxing sundowners to cool down. Outside, tall palm trees and native greenery are carefully positioned to retain seclusion without ruining the view. Both inside and out the Beach Spa Pool Residence (230 sqms) is a fantastic treat for a large group, be it family or friends. Sleeping options are flexible with two of the bedrooms offering king beds, memory foam mattresses and en-suite facilities. These include a stand-alone bathtub and shower. The third bedroom has twin beds and en-suite shower. All are exquisitely designed. The indoor and outdoor living area offers a perfect space for dining and socialising. The large dining table seats up to 6 people. In the afternoon, cool down in your private plunge pool or sip a drink on a sun lounger on the patio. Daily, expect our masseuse to deliver an ultimate relaxation with a complimentary 1-hour couple massage in your private double spa treatment room. Other amenities include a minibar, wine cellar, and Mӧvenpick coffee with espresso machine. 55" LCD TV is available as is free WiFi. Air-conditioning and in-room safe come as standard. The Beach Spa Pool Residence accommodates up to 6 adults, or 4 adults and 2 children. 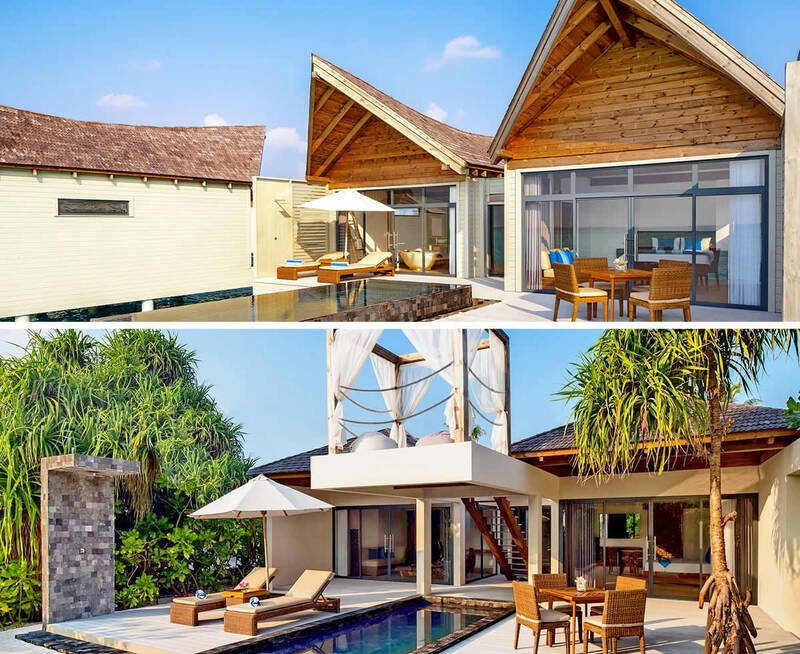 Overwater Pool Villas is a spectacular accommodation with breathtaking blue lagoon views. A private plunge pool situated on the outdoor sundeck, allows you to chill out in style. The villa's interior is set across 140 sqms and have glass bottom floors from which you can see the tropical life below. The accommodation comes with a bedroom offering king or twin beds all which have a relaxing memory foam mattress, perfect for sleepless nights. The luxury is completed with an outdoor shower, and a stand-alone bathtub behind the floor-to-ceiling windows. Bathrobes and hairdryer are also included. Should you want to unwind indoors you'll also find a 55" LCD TV, a minibar, wine cellar, and Mӧvenpick coffee with espresso machine are also included. Free Wi-Fi, safety deposit box and air-conditioning come as standard. Overwater Pool Villa accommodates 2 adults and 1 child, under the age of 2. One of the brightest impressions in Mövenpick Maldives is a world-class cuisine in a unique setting. The resort's chefs just love pulling out all culinary stops, making dining at the five-star Mӧvenpick Resort Kuredhivaru Maldives an experience to remember! Apart from four beautiful restaurants, the ‘Destination Dining’ initiative offers tailor-made possibilities for special occasions. Culinary adventures will warm up your appetite and surprise with innovative and special offers designed to bring to the guests fresh tastes and new concepts. Legendary specialties such as the famous Zurich-style veal, as well as the appetizing Mövenpick Premium ice cream, the aromatic Mövenpick coffee, creamy chocolate, delicious jams and yoghurts, and of course the unique selection of fine Mövenpick wines is something that you should definitely try! 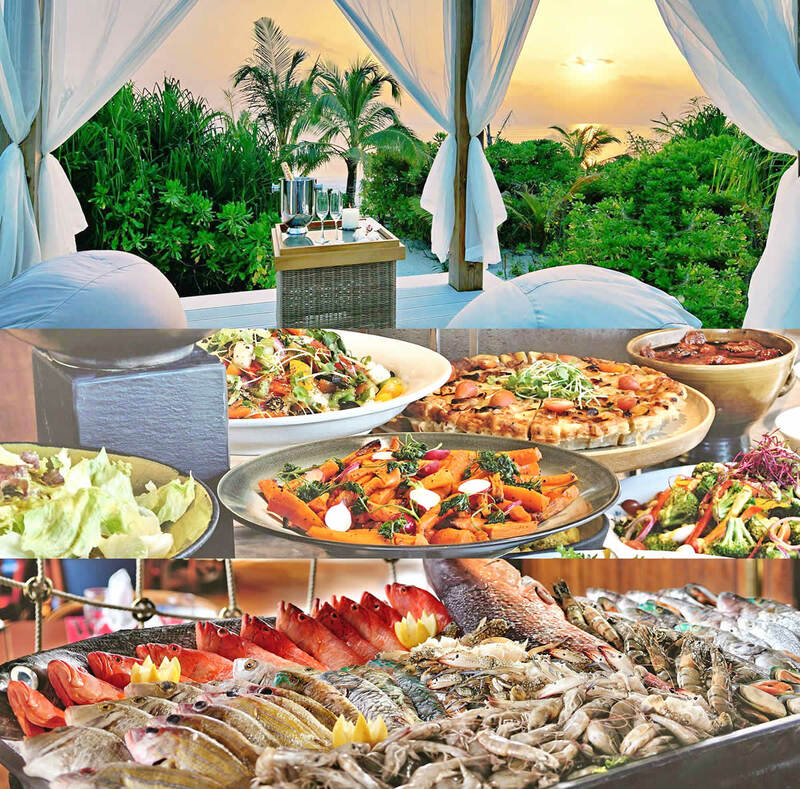 Serving international buffet with market-style, themed night and à la carte for breakfast, lunch and dinner, ONU Marché is the resort's main restaurant overlooking the beach. The generous buffet breakfast at ONU Marché makes every morning good. Mӧvenpick’s signature marché concept is an experience where you will easily yourself indulging in fresh, locally sourced produce, wholesome nutritious food, local specialities, and comfort food. Live cooking action stations add an element of fun, while you enjoy the culinary delights offered at the marché. In addition, refreshing alcoholic and non-alcoholic beverages complement your favourite dishes. Dress code is resort casual. Situated an on overwater pavilion, Bodumas Overwater seafood restaurant serves fish, mussels, oysters, sushi, crab and shellfish in international classics and lightly spiced local recipes. Enjoy 360-degree views of the lagoon along with fresh seafood and amazing vintages from around the world. With casual elegance, contribute to the great experience, Bodumas is the must-go place to get lost in the rythmic percussion of waves, while the sun is sinking in the ocean. With the best location for sunset, lunches and dinners are well catered for at the Latitude 5.5 Restaurant serving prime grilled Wagyu beef rib-eye, relish sizzling jumbo prawns and burgers. Located by the main infinity pool at a perfect latitude, you'll be mesmerised by the stunning sunset. A trendy, poolside restaurant alances just the right amount of ambiance and the island lifestyle livens up your spirits with a choice of classic and exotic concoctions, while you listen to music with tropical vibes. Poolside dining at Mӧvenpick Resort Kuredhivaru Maldives is indeed a delightful pleasure. Close to Bodumas, Mövenpick Coffee & Wine Lounge is the café and wine bar with quality treats such as vintage wine tastings, coffee, ice cream, and a daily Mövenpick Chocolate Hour. Expect a variety of top quality Mӧvenpick products including coffee, chocolate, ice-cream and wine. For a selection of decadent delights, join at the Mövenpick Chocolate Hour – offered with the compliments, every day. Swing by for a wine tasting experience and sharpen your ability to recall wines – a great way to start the tropical sundown at Mӧvenpick Resort Kuredhivaru Maldives. The resort's destination dining options include but are not limited to, Champagne breakfast, lagoon lunch, bubbly cocktails at sunset, dine under the stars, 'a night to remember', private BBQ and castaway dining on a private beach. An exclusive dining experience created to meet your request, in beautiful tropical locations with tailor-made menus. Whether you are a family, regular divers, wellness seekers or a honeymoon couple, you will be spoiled of the things to do on vacation in the Maldives. Active guests will enjoy a daily fun diving trips to unspoilt reefs teeming with marine life. Noonu Atoll is a wonderful playground if you like snorkelling and scuba diving. The resort’s licensed divemasters guide divers to the best spots. The Raafushi, Christmas Tree Rock and Orimas Thila - must dive! The resort is also the perfect destination to take learner dive courses and gain basic certification. Those who desire a chance to explore without exerting themselves can hire a private trip by fully-crewed catamaran. For those who seek adventure, the water sports centre offers an exciting range of activities including parasailing, windsurfing, water skiing, jet skiing, banana ride and sailing. Hop on board and explore the islands nearby, as well as the beautiful, abundant marine life in the Indian Ocean and Maldives. The exursions on offer: Dolphins' point, snorkelling safari, island hopping and much more. The signature Sun Spa by Esthederm is an oasis of calm, where trained therapists soothe mind and body with massages and individually prepared lotions. As replenishing oils restore the body, the serene unbroken ocean views from each secluded bay relax the mind, leaving guests truly at ease. Younger guests are also taken care of at the Little Bird Club where games, puzzles and activities will keep active minds entertained throughout the day, ready to rest again with parents after an exhilarating day. Experienced team members offer activities for kids in different age groups and with diverse interests. fitness centre and restore mind-body balance at the Yoga Sala. The full-sized tennis court and multipurpose court for football and volleyball give groups of any size chance to exercise every day. Paradise as a backdrop for your wedding? Ready to re-enact those blissful wedding promises? Mӧvenpick Resort Kuredhivaru Maldives is a perfect place for your special day. The overwater yoga sala at the resort offers an amazing backdrop for the wedding ceremony in the Maldives, especially at sunset.